Bryce Pinkham rocked our world in Bloody Bloody Andrew Jackson, took down Richard Fleeshman in order to win Caissie Levy’s heart in Ghost and gave us legs for days in Shakespeare in the Park’s Love’s Labour’s Lost. 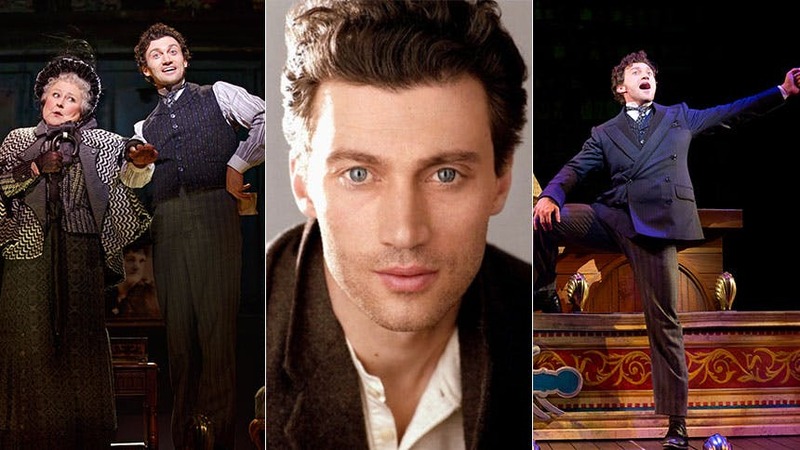 And while we loved him in each, now Pinkham has found the role that is “a perfect fit for me and my strengths.” Pinkham is slaying Broadway audiences as social-climbing killer Monty Navarro in the hilarious and critically-acclaimed musical comedy A Gentleman’s Guide to Love and Murder. BroadwayBox caught up with the headliner and humanitarian to talk about his life-changing experience in Africa, the unusual way he turns on his brain before shows and making peace with his short shorts. 1. Can you walk me through your pre-show ritual? Well, it’s tricky. I warm up almost like I’m going out to play a soccer game or something (because I’m out there the whole time), but I have to be careful not to go too far where I have no gas left in the tank. One thing Jefferson [Mays] does that I have adopted is he goes around and says hi to everyone. So, I try to make sure I get a chance to check in with all of my scene partners before the show starts. In terms of other things, sometimes I juggle. I have a weird obsession with juggling—it’s playful but it also focuses me. I go through some of the more extensive lyrics while I’m juggling, just to make sure my brain is fully turned on. 2. Let’s talk about Zara Aina; what was your experience like in Madagascar? My friend and I built this organization together, and our pilot program in Madagascar was in May of 2013. We went for a month and worked with 14 at risk kids; we built a show based in folk tales and toured it around the country with them. It was a life-altering, mind-altering, heart-exploding experience. Gentleman’s Guide was one of the first auditions after I got back, and I have no doubt because my time in Africa I was better prepared to do this. The perspective one gains going to a third world country, and living quite differently than the life of a lead on Broadway, helps you see what’s actually important. It makes everything that much more important and that much less important. 3. You have unbelievable hair. What’s your number one hair care rule? My number one rule is not to fight against it. To be honest, I have a very strange relationship with my hair because I didn't know what to do with it for the longest time. We call it “The Beast” because it takes a certain amount of product, and even pins, to keep it in place so it doesn't go wild during the course of the show. So, I’ve learned it requires time and patience to appreciate the strength of what genetics have given you. 4. Famous Brit you’d love to grab some tea with? My first thought is any of the Monty Python boys. I grew up watching those movies and I think that's where I learned a part of my sense of humor. (And I dare say, some of it comes through in Gentleman’s Guide.) I think tea with them would be the craziest tea anyone has ever had. Charlie Chaplin was British though, and I’m a big fan of physical comedy—and especially his—so I might have to go with Charlie. 5. What was your first reaction when you tried on those tiny Love’s Labour’s Lost shorts? My first reaction was, "Not short enough!" [Laughs] No, really my first reaction was, “Oh Alex Timbers, you've done it again.” They grew on me; I made my peace with that costume quite quickly and really looked forward to that moment every night. And if you are going to wear short sparkle pants, where better to do it than Central Park?